Who is Who at Gulf Tower? 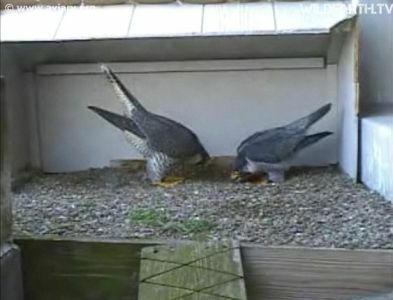 Here are some quick tips for telling the difference between the two adult peregrines on the Gulf Tower falconcam. 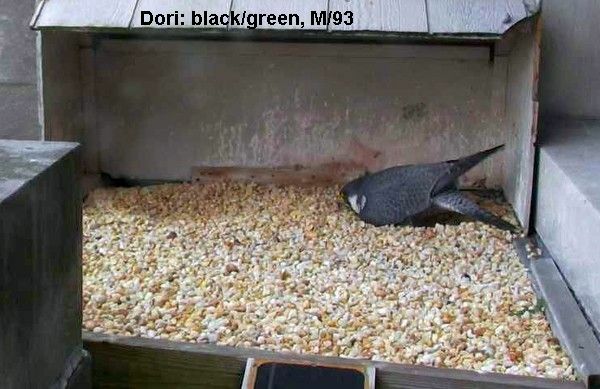 Dori has white patches where her wings meet her body. They are almost like “headlights” because they stand out when she faces you. 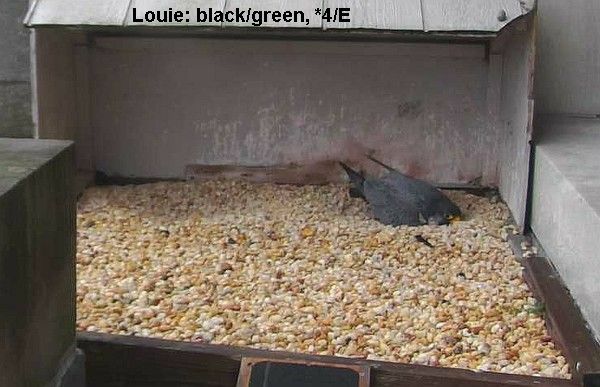 Louie does not have white patches near his wings. Instead he has a large white patch on the nape of his neck. You can see this easily when he bows. Dori is much larger than Louie. The next photo is a side-by-side example showing the difference. Notice Dori’s long wingtips and tail. When she stands or turns in the nest box her tail often touches the wall. And (as Mary DeV reminded me in a comment) Louie’s beak is a brighter yellow than Dori’s. Here are two more photos showing Dori, then Louie, in the same scrape. She is large! He is small. Female peregrines are larger than males. I have written their band numbers on the photos even though it’s nearly impossible to read them on camera. If you see both birds together you can identify them immediately by size, as shown in the photo below. Dori is huge. No wonder Louie bows low! Watch them online here and see if you can tell the difference. Feed at COL was later today; 6:45 rather than 6:30 but so precise, everybody gets fed & quiet & back to sleep. The contrast between the pair at Gulf was wonderful to see. I would bow to Dori myself. She is magnificent. Can’t wait to see her brood hatch. Well now I can start my week with a smile & more knowledge. Thanks Kate for bringing the info to us. I think that Louie’s beak is much brighter yellow than Dori’s — hers is a more pale, cream color. If all I can really see is the face, I can usually tell by the color of the beak! A friend who lives in Highland Park said she used to see a peregrine cruising around the park last year. I bet it was Dori aka Mary Cleo, back when she was living at the 62nd Street Bridge. I haven’t seen news of it here, but am I wrong in thinking I am seeing/hearing a chick at Gulf Tower? Parent doesn’t seem to move away long enough to verify, but I really think I saw a ball of fluff moving independently a few minutes ago. Maybe just the wind? Thanks for the info. I’m very new at this and any knowledge great. This “bowing” thing, is that for real? Yes, bowing to each other is part of their courtship ritual.